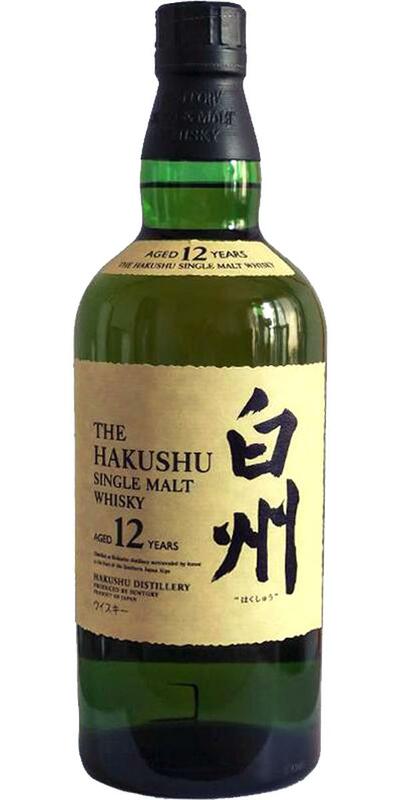 Although Hakushu 12 doesn't have the caliber of Yamazaki, it is certainly a characterful and distinctly different Japanese Single Malt. Featuring floral and grassy notes, the aroma is quite complex with fresh herbs, heather honey and citrus fruits. A thin layer of delicate peat smoke is well-integrated. On the palate, the fruity sweet arrival turns into zesty but rather mild peatiness, dominated by herbal freshness. The moderate finish is peppery, slightly dry and leaves with a hint of oak bitterness. Overall, a harmonic and nicely composed malt with character. Is a pretty interesting Japanese, which is evaluated by the light smoke flavors. I like it a lot and it would be even better with a bit more power. Amazingly I’ve had this only once before, many years ago. N: Wth a fatty and buttery body, it’s a fruity [Speyside style] malt with luscious and rolling tropical & orchard fruits. T: Rich lush lemon honey dunnage-y malt that suggests a maturity beyond those 12 stated years. Then comes the smoke whilst the waxy & fatty spirit continues to sing. F: Sustained sweet honeyed smokey barley juice, finishing with clean toasted dry/smokey malty & milky Cocoa Pops. Rich, complex, fresh. A very beautiful Japanese expression. Much more enchanting than his brother from Osaka the 12-year-old Yamazaki. If it were to be given a subjective note, it would be an 87. Dress or, poor fine and slow. A taste on the palm carries Spring, white flowers, fresh currants, caramelized pear and freshly cut grass. On the nose, the identity is posed, that Hibiki Either (largely composed of Hakushu) or Yamazaki, cross them Same Markers: Fruits and fresh white cooked, pear, apple and peach white area. The white flowers sit alongside a pleasant acidity that reveals tangerine and candied lemon. Everything becomes darker, marzipan, tobacco, leather. Spiced with cinnamon and ginger, smoked earth. A nose of great freshness, complex and expressive. It is sweet and earthy on the palate, toasted, delicately smoked, zan, then fruity, cooked pear topped with dark chocolate, peach compote. Floral too. Then we go back to the earth, smoked peat, musk, green pepper, chilli and camphor. The finish is medium on spices, pear and smoked peach. Long persistence on pear William. Empty glass is spring, blackcurrant bud, ginger, earth and smoked, harlequin candy. Lovely. Kumquats, Physalis, freshly sawn light wood. Dandelion, a little vanilla and a touch of glue. Light. Mild honey, toasted bread with butter, a touch of white pepper. A hint of apricot jelly. Milk chocolate.